Meet the Lorenz family! Dealing with the logistics of raising two boys in travel sports doesn’t always make family dinners easy, but Loren and Art are managing to make mealtime a priority. Loren and Art Lorenz and kids JJ (17) and Brady (9), of Rockledge, Florida. Just getting everyone to the table can be difficult in the Lorenz household, as it is for many families with active kids at home. Finding time to gather all four family members for a meal is a challenge, but also a priority. 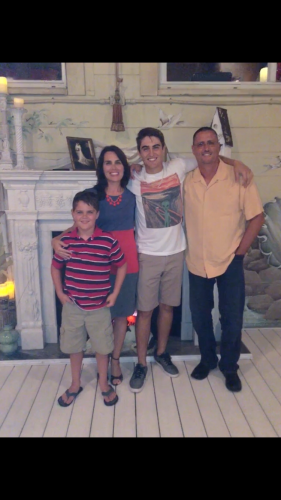 Loren shares that this spring, it’s especially difficult to make time for dinner together, as the boys have baseball 5-6 days a week, and older son JJ is preparing to graduate from high school — a busy and exciting time in the life of any family! For Loren, the solution to making family dinner happen amidst all the competing events on the calendar is to be structured. “Schedule it! Make Sunday dinners important, and be firm about this. No exceptions unless someone is out of town.” Because JJ and Brady play sports and sometimes have travel tournaments, there are times when all members of the Lorenz family can’t gather for Sunday dinner, but making it a standing appointment and holding firm makes those scattered days the exception rather than the rule. The Lorenz family also makes sure to bring the “fun” element to the table whenever possible. Loren says “Anything I can do to get them all together for just a short time is worth the silliness, even for my 17-year-old!” Recently she enticed the family to enjoy snacktime together with a funny “squirmy cone” snack in honor of Earth Day — a hit with everyone, proving that even teens aren’t too cool for family time, especially when there’s food involved. With time at the table being precious, Loren says she is always eager for any quick and easy tips to help the family connect. One of her strategies is to take screen shots of games and conversation starters from The Family Dinner Project and save them for later, so she can quickly grab a new idea when she needs one. For Art and Loren, connecting with the family at the dinner table means they have structured time to get to know each other in new and deeper ways. Loren says the best part of being together at dinner is finding out something they didn’t know about the kids, or hearing stories about events and funny things that have happened in JJ and Brady’s lives.